I love the idea of a winter white skirt. Practically speaking? Not so much. For one, I can’t keep anything white clean (remember my white pant disaster?). Second, I’m not a fan of tights with a winter white skirt. This J.Crew No.2 Pencil Skirt in Double-Serge wool is really a fall/winter fabric making it not as versatile as a skirt that is made of ponte or a lighter weight wool. Fall and winter means skirts must be worn with tights more often than not and there is no way around it (at least where I live). I’m on the fence about keeping this, but here are a few outfit ideas that I came up with using pieces I currently have in my closet in trying to decide whether I should either keep or return it. I’m obviously not having a hard time coming up with outfits. I think I’m just having buyer’s remorse over all the stuff I’ve purchased the last two months, and I still need to buy a suit (or two) for the new job I’m starting in the new year. I’m trying to figure out what, if anything, I can return and not regret later; however, the more outfits ideas I come up with for this skirt, the more I fall in love with it. See Elle from FastFoodandFastFashion with her many “one item, five ways” posts here! Do you have any favorite ways to wear a winter white skirt? you did such a great job styling the white skirt! i can’t decide which is my favorite look; they’re all really nice! I love all the outfits, with tights and without. I definitely think this is worth keeping, especially since it’s office-appropriate! Oh, I love this winter white skirt on you! Every look is fabulous My favorite title is “Like a lady” (LOL), and my favorite look is with the green sweater and tall boots. 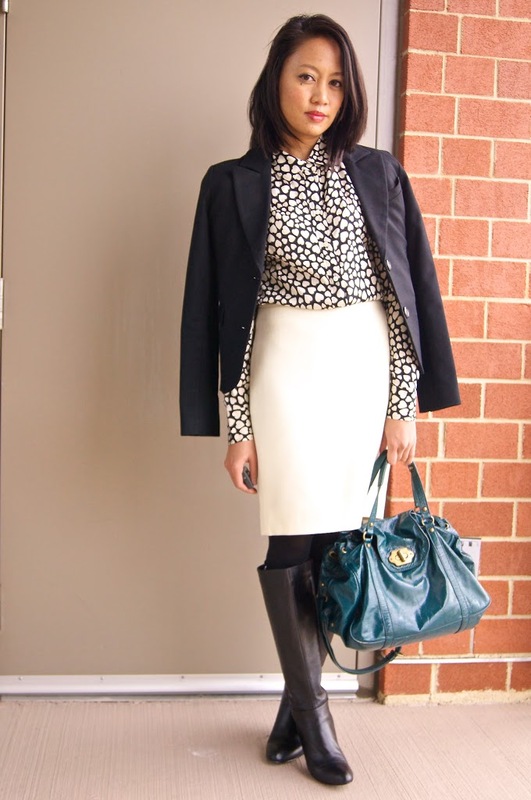 love all the ways you styled this skirt! you look great. This is amazing! I love them all! #1 and #3 are my fav’s! I have a fear of white too, but you look great in yours! I think you need certain figure to pull it off, which you do! Work it! My fav from your pairings are actually the more casual ones – green turtleneck (love it high waisted with belt and coordinating boots) and last sweater (love the rock n roll feel). I like the different ways you’ve styled it. Definitely a keeper! You look great in The white wool skirt – dfinitely a keeper. It looks like this skirt is definitely a keeper! I didn’t think I’d like it so much with the chambray, but I actually think it’s the best look. Knee high boots are definitely a way of wearing it without adding tights, and I think you actually look super tall when it’s styled that way! love these posts!! ive been looking for an off-white skirt, too 🙂 now i have great ideas of what to wear it with! I love all your ideas in how to wear a white skirt. They are all dainty. You made some really attractive outfits with that winter white skirt. Duplicating the 3rd and 4th.